U.S. seaborne import growth slowed to 1.8% in November as a result of lower shipments from the EU, not because of China tariffs. OPEC’s latest cut only partly offsets the decline in net imports seen in the U.S.
Also: GoPro is partly withdrawing production from China as a result of tariffs; the latest U.S. aluminum trade case helps Hindalco and hurts American buyers; container handling through Norfolk, Va. could fall further if retailers cut their Chinese imports; Panama Canal traffic growth is slowing, it hopes a Brazilian deal will help; U.S. LNG export capacity is growing – a deal with China is needed to realize its potential; China-U.S. trade talks have gotten underway with 80 days to go; Brexit uncertainty extends and deepens; and FMC findings could improve port operations, avoids anticompetitive accusations. 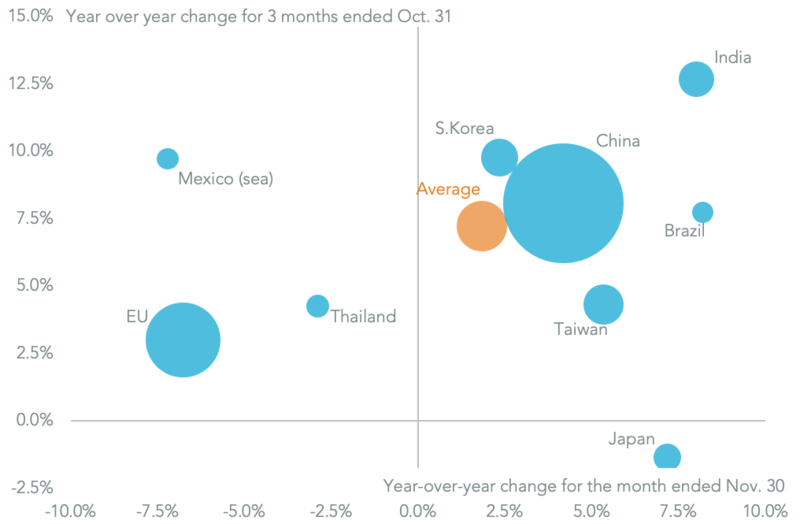 The 21-month run of growth in U.S. seaborne imports may be near and end. Growth in November was just 1.8% on a year earlier, including 3.7% for containerized freight, compared to a 7.2% surge seen in the prior three months. 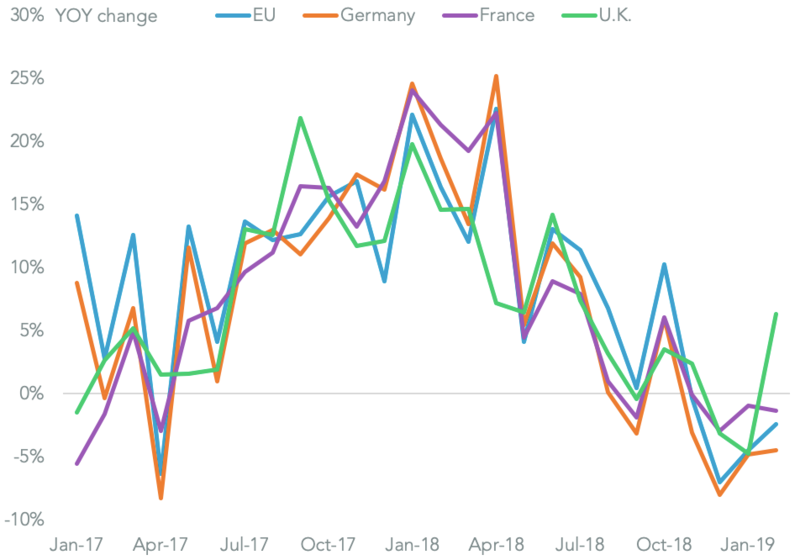 The main culprit was a reversal in imports from Europe which fell 6.8% after a 3.0% improvement previously. 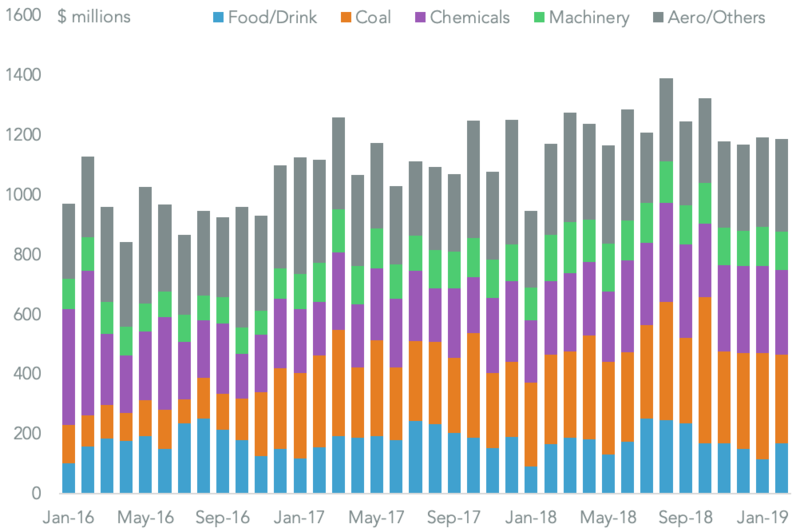 By contrast Chinese imports continued to expand despite the second full month of duties on $250 billion of imports, though the 4.2% growth was slower than seen previously. The slowdown in total imports was most marked in industrial supply chains. Imports by the automotive industry fell 4.7% including a 10.4% slide in imports of auto parts from Europe. That would suggest reduced concerns about the ongoing national security trade review of the sector as well as falling U.S. automotive sales. There was also 0.5% decline in imports of machinery and equipment alongside import growth of just 1.7% for iron and steel – both bode ill for the state of the economy more broadly. The latest OPEC meeting has agreed to cut global oil supplies by 1.2 million barrels per day (mbpd), or 2.3%, across both OPEC and cooperating partners. That’s had a negligible impact on prices that had previously fallen by 31.1% since their Oct. 4 peak. One reason for the need for a cut in production has been a decline in U.S. net imports to 3.7 mbpd in October from 5.2 mpbd in 2017 on average. 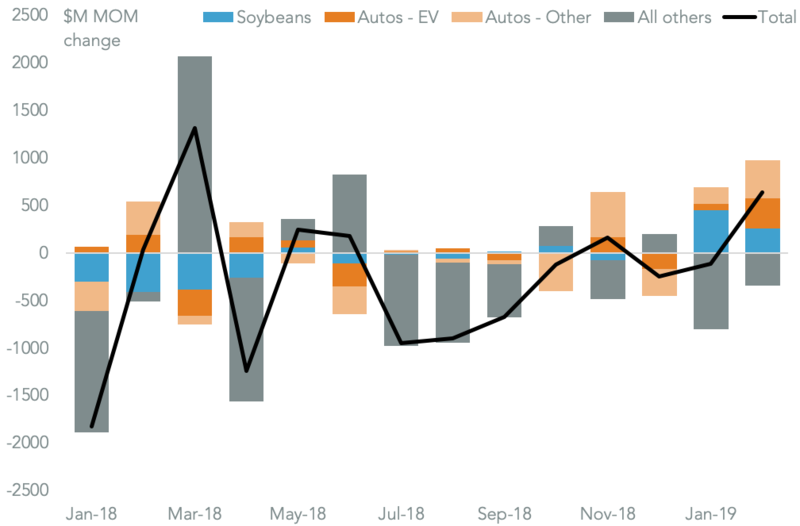 U.S. export growth has slowed recently due to the absence of demand from China which has been the result of the application of retaliatory duties, though total exports still climbed 34.3% to 2.3 mpbd in October. Demand from China for U.S. oil may resume following the tariff ceasefire reached recently. While U.S. seaborne imports have also been declining, by 11.4% in November for seaborne imports, American refineries have been following disparate strategies. As an example Valero and Chevron have been increasing imports while Exxon Mobil and Marathon have been cutting theirs. Sports camera maker GoPro has decided to shift production for the U.S. market out of China in order to “proactively address tariff concerns” according to CFO Brian McGee. The move may be done at a “relatively low cost” given GoPro owns its production equipment. It isn’t clear yet where production will move to or whether there will be a loss of economies of scale. GoPro had already started to scale back imports from China with a 35.8% decline in seaborne shipments in the three months to Nov. 30 on a year earlier. Other manufacturers may be following a stockpiling approach to addressing tariffs. Total U.S. imports of digital cameras from China jumped 35.8% higher in the three months to Oct. 31 compared to a year earlier. The U.S. government has confirmed that Chinese exports of aluminum plate have harmed U.S. aluminum manufacturers, allowing duties to be applied. Chinese manufacturers have already withdrawn from the market – imports from there fell 92.2% in the three months to Oct. 31. Yet, those have been largely replaced by supplies from elsewhere with total imports down just 5.5% over the same period. The case has also resulted in a 16.5% rise in average costs per ton, hurting U.S. users of aluminum including Hunter Douglas. Shippers to the U.S. that have taken advantage of the absence of Chinese suppliers include Hindalco and Constellium which increased their U.S.-bound shipments by 25.8% and 12.3% respectively in the three months to Nov. 30 vs. a year earlier. Walmart and Amazon bring China risk to already lackluster Norfolk, Va.
Container handling at the port of Norfolk Va. fell 0.3% on a year earlier in November. That was led by an 11.3% drop in exports – which bodes ill for the local economy – and continues a run of lackluster growth at the port. A 1.4% rise in inbound traffic was the result of declining shipments from the EU whereas imports from China soared 13.4% higher. The latter came as importers including Walmart, Target and Amazon sought to preempt the risk of tariff increases that had been scheduled for January but are now delayed to March. 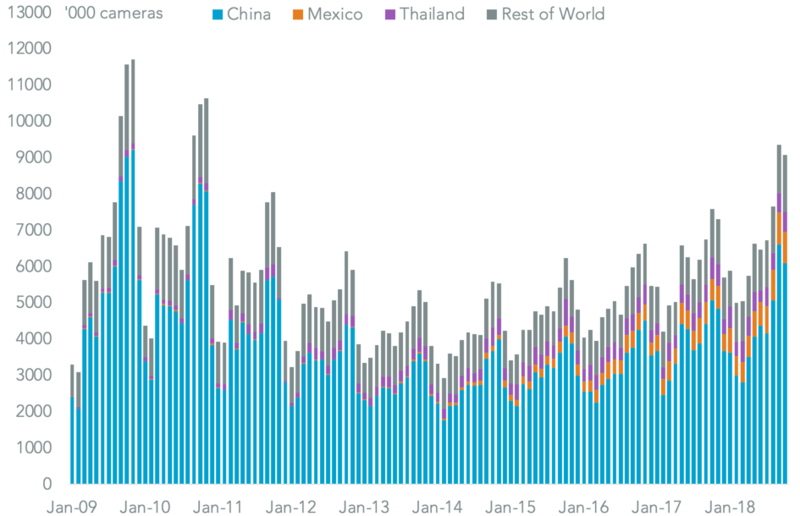 A slowdown in their shipments may overshadow the ports’ performance in early 2019 given China represented 33.9% of inbound shipments in the 12 months to Nov. 30. Traffic transiting the Panama Canal fell 1.7% on a year earlier in November. Competition with the Suez Canal remains fierce and will become more so if the U.S.-China trade war widens. That’s lead Panama Canal authorities to reach a deal with the Brazilian port of Itaqui to promote commodity shipments via the Panama Canal to Asia. Itaqui has already seen a 24.8% increase in the 12 months to Oct. 31 vs. a year earlier in soybean exports, which represent 65.1% of volumes passing through the port, as a result of increased Chinese purchases of Brazilian soybeans. The EIA expects U.S. LNG export capacity to increase by 36.1% by the end of 2018 and by a further 2.5x by the end of 2019. Exports from existing facilities climbed 40.3% on a year earlier in the three months to Oct. 31 as a result of the opening of Dominion Energy’s Cove Point facility. The U.S.-China trade war has taken a toll on exports though with shipments to China down 53.7% over the same period. A commitment by the Chinese government to resume imports should help boost demand as new U.S. plants come online, though there are signs of a slowdown in China total LNG imports in the month of October. The Chinese government has stated that talks to reach a trade deal with the U.S. have begun with representatives including Vice Premier Liu He and U.S. Trade Representative Robert Lighthizer and Treasury Secretary Steve Mnuchin. No details of topics provided have been provided, though the start of talks gives some hope that the remaining 80 day timeframe for talks – as outlined in Panjiva’s research of Dec. 3 – may prove sufficient to reach a deal. In the meantime early announcements of Chinese imports of soybeans and energy (see above) could help smooth the way. The U.K. government has delayed a vote on the package of Brexit measures to avoid a significant loss in Parliament. The process has again been bedevilled by the so-called backstop – i.e. remaining in a customs union until a route is found to avoid border restrictions between Northern Ireland and Ireland. The European Council has made it clear that the withdrawal agreement cannot be changed but that there could be room in the political declaration regarding future relations. As flagged in Panjiva research of Nov. 27 the uncertainty continues to cloud business decision making for both purchasing and investments. The Federal Maritime Commission has announced four measures that it wants to see implemented into port demurrage and detention charges (excess use of terminal and container resources beyond those allotted) with an expert panel set to make recommendations in 2019. As flagged in Panjiva’s 4Q Outlook the review has cast uncertainty over the competitive structure of the U.S. ports and carrier sectors and could result in significant changes to wider industry rate setting, though at least anti-competitive behavior has not been found. Programming note: The Panjiva Daily will be taking a short break and will return on Dec. 15. In the meantime you can catch up with all the research and panjiva.com/research.